This post is the second in a six-part series on Atomic Object’s ownership and the non-ESOP approach we took to gradually shift from a founder-owned to a broadly employee-owned company. The focus in this post is describing the plan we created and the ESPP we adopted. We have two programs in place for employees to buy shares of the company. The first, launched in 2009, is what we call the Atomic Plan. This plan is entirely home-grown, and it’s how the vast majority of shares have changed hands from founders to other Atoms. Individuals either buy shares directly from another individual or from the company (with a corresponding redemption by another individual). In either case, there’s a conservation of shares. While the mechanics and tax consequences of these two approaches differ, I refer to both as “sales” when it doesn’t matter. So far, the only seller of shares has been a founder, though our program doesn’t assume that. Financing is available from the founder. We’ve made strategic exceptions to the five-year guideline. The initial offering in 2009, when the company was eight years old, went to eight individuals with at least 4 years of service. Seven of the eight participated; the eighth person soon departed for a PhD program. Exceptions in more recent years have been made, with limited success, for strategic leadership hires and new offices. The Atomic Plan was defined in a private placement memorandum, or prospectus. I drafted this document originally, then passed it to our lawyer for technical additions and a review of my lay person’s language. Our lawyer did an excellent job preserving my tone and style, while keeping us safe and in compliance with various laws and legal standards. We’ve continued this joint ownership over the years as we’ve refined and improved the document. Appendices to the prospectus include the operating agreement of the LLC, historical financial data, our valuation model, current financial statements, and a history of our investments. A binder is assembled that includes the prospectus, appendices, prospectus release notes, share purchase agreement, financing documents, and an 83(b) election form. We strongly encourage Atoms to share the entire binder with their significant other and view their decision to invest in Atomic as a joint one. We also encourage them to seek their own counsel from an investment, tax, and legal perspective. Shareholders of Atomic are members of the LLC. There is only a single class of shares, so every member has the same rights and responsibilities. (There are a very few exceptions called out in the operating agreement for founders.) Current LLC law limits the number of members to no more than 100. We use the exemption found in “Regulation D, Rule 504” to avoid the hassle and expense of registering our private placement with the SEC. The critical limit for this exemption is that you sell less than $5M of shares in any given year. A Michigan state exemption requires that fewer than 25 people buy shares, and that they are all residents of the state. The second program we’ve used to broaden employee ownership is an ESPP (employee share purchase plan). ESPPs are a well-defined vehicle used by many companies. Ours is a non-qualified ESPP. We’ve gained significant breadth in our employee ownership through the ESPP. Of 37 total shareholders, 25 of them buy through the ESPP. Employees with at least one year of tenure may buy up to $4,000 of shares per year through payroll deduction. ESPP buys cannot be financed. Shares purchased through ESPP are activated from a pool equal to 10% of the original total shares created. We launched our ESPP in 2013 as a response to an unintended consequence of the Atomic Plan. Before the 2009 share offering, there was no distinction between owners and employees. We were around 20 people at the time. Two of us were founders, and I don’t think anyone thought twice about the fact that the co-founders owned the company. After the initial offering we had seven new shareholders, and soon after that, people, including me, started talking about owners and employees. While the initial annual purchase limit of the ESPP ($2,000; we raised it recently) didn’t make the acquisition of large numbers of shares possible, the ESPP did allow many more people to participate in ownership. At the same time, we shifted our language from “owner” to “shareholder”. I believe both moves were important to breaking down the “us/them” dichotomy we’d seen developing. In five years, employees have purchased 1.34% of the company through the ESPP. This is accelerating as we grow, and since we raised the annual maximum to $4,000 a couple of years ago. About half the plan participants purchase the maximum amount each quarter. ESPP buys happen every quarter. Participants accumulate funds through payroll deduction. We update our valuation, figure out the total number of shares being purchased (rounded to whole shares), then activate that many new shares from a pool of inactive shares created when we set up the program. We mistakenly thought about and referred to ESPP purchases as dilutive to existing shareholders when we set the program up. Later we realized that because the proceeds from the sale of shares through ESPP are distributed to existing shareholders (i.e. we’re not trying to raise capital), ESPP buys are more like a mandatory sale that every shareholder participates in pro rata. Updating our valuation every quarter forced us to get good at doing it. Processing many transactions each quarter at differing prices for multiple people encouraged us to improve how we track shareholdings. The managing partner who is responsible for the ESPP wrote a simple CRUD web app on top of a share transaction log to tell us at any time how many shares are outstanding, who owns how many shares, what they paid for them, and what the source of the shares was. Our sharetracker app has become essential for handling buybacks and calculating basis. In nine years of operating the plan, we’ve experienced the departure of Atoms holding both large and small numbers of shares from both the Atomic Plan and the ESPP. All shareholders must sell their shares back to the company if they leave employment. This is a critical detail to get right if, like me, you want to see your company be around indefinitely. Keeping ownership inside the company is a pre-requisite to controlling your fate. ESPP shares are bought back at the current valuation, regardless of how long they’ve been held. Shares acquired through the Atomic Plan have a 10-year vesting period on the potential for capital gains. When these shares are bought back, it is at the lower of the price they were purchased for, or the current valuation. The financial benefit of owning shares of Atomic starts the day you own them. 75% of the net profit from the core operations of the company is distributed through shares each quarter. While the first shareholders have a very nice paper gain on their shares, all shareholders experience a very good dividend yield from their shares. Selling shares back upon departure for what you paid for them originally hasn’t meant they were a bad investment. So far, we’ve never experienced a decrease in share value that’s meant a departing shareholder gets less than what they paid. To protect the company, large share re-purchases may be handled with a 10% downpayment and a five year promissory note and payback period. We’ve only used this upon departure of my co-founder. Our vision to be 100 years old requires that we keep ownership inside the company. But an LLC can’t own itself, so when a shareholding Atom departs, those shares must go to other Atoms. We call the algorithm to decide who buys them our waterfall. Since the company can’t hold shares of itself, the first option in effect destroys the re-purchased shares. This has the effect of decreasing the number of shares outstanding and thus increasing, in a pro rata fashion, the percentage of the company owned by each member. No one’s share count changes, but there are fewer total shares. It’s mandatory anti-dilution with a corresponding payment or liability for the shares re-purchased. We used this when my co-founder left the company. The second option lets founders (only me, at this point) buy shares back. Because I want to decrease my holdings over time, I prefer other options, but will use this when I sold the shares in the first place and I don’t feel the other options are good. The third option lets the managing members of the LLC direct the option to buy some or all of the shares to one or more members. This gives us the opportunity to strategically increase the ownership of individuals. We’ve used this for people in leadership positions, or senior people who first bought shares at approximately the same time the shares being sold were originally bought. The last pool in the waterfall lets every member of the LLC decide for themselves whether they’d like to purchase a pro rata portion of the shares available. When shares purchased through the Atomic Plan are re-purchased from a departing member, unless they’ve held those shares for more than 10 years, the re-purchase price is the same as the original purchase price. 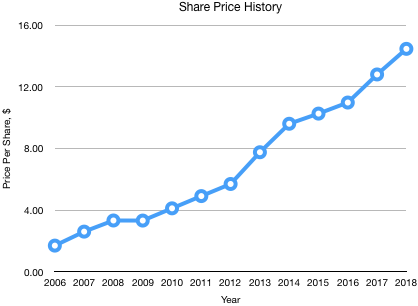 As the graph below shows, the price per share of Atomic has grown consistently over time. Shares that were acquired five years ago were bought at a price only slightly more than half of today’s valuation. Members who participate in the re-purchase of shares are doing so at a potentially substantial discount from today’s valuation. For this reason, the third pool of the waterfall, where managers decide which members are offered the opportunity to purchase shares, needs to be carefully considered. Not only is the opportunity to purchase any shares at all valued, but shares that become available from departing members come at a discount. Is there someone whose ownership stake I think should be greater, and who already owns shares from roughly the same vintage? Were the shares originally sold for a particular reason, such as strategic leadership in a new office? Can that reason be preserved? Do I feel good about having sold these shares in the first place? Do I want to effectively reverse that transaction by re-purchasing them myself? If there’s no obvious individual choice, would it be good for the company to let everyone participate in the bonanza of buying discounted shares? If the amount is substantial, maybe it’s easier to have the company redeem the shares and manage a single transaction and loan? I wish I could say that every person is always happy with every decision made concerning departing member’s shares. That’s probably an impossible goal. But I can say that we’ve never experienced an employee departure or even a serious conflict over these share re-purchase decisions. I believe consistency, transparency, and careful communication are critical to having most people judge our decisions as fair most of the time. The next part of this series will go into detail on the key issues of valuation, financing, and distributions.